His name is Hole, Inspector Harry Hole of the Oslo Crime Squad, and holes — six-foot-deep ones — are where the bad guys he hunts usually end up. 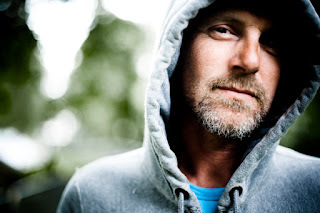 Norwegian author Jo Nesbo’s dipso, drug-dabbling, insubordinate lone-wolf lawman is the sort of guy mothers warn their daughters to steer well clear of, yet countless thousands of women — and men — go to bed with him every night. 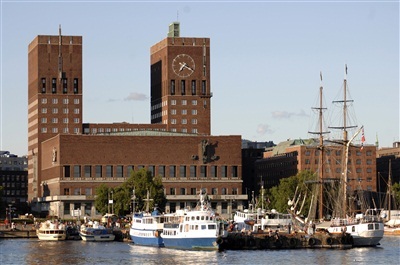 In neighbouring Sweden, the late Stieg Larsson’s Millennium trilogy has fuelled a big increase in visitors to Stockholm, with fans of Mikael Blomkvist and Lisbeth Salander flocking to join organised tours of the places mentioned in the books. Now Nesbo aficionados Mari Atlanta Lunde and Anne Marie Voien Fleischer have launched once-a-week Harry Hole walking tours of Oslo (150kr/€20). The tour I joined last month was only the third, but going by the enthusiasm of the Nesbo fans who braved a freezing cold evening — the temperature later dropped to minus 14C — the ladies are on to a winner. Larsson’s novels have sold 63 million copies worldwide and are still flying off the shelves seven years after his death. The release last December of the Hollywood version of The Girl With The Dragon Tattoo starring Daniel Craig as journalist Blomkvist and Rooney Mara as avenging angel Salander has further boosted visitor numbers to the Swedish capital. Nesbo’s books have some catching up to do — 14 million sales in more than 40 languages to date — but with at least one more Harry Hole story to come (The Phantom will be published in Ireland and the UK next month) and Martin Scorsese signed up to direct The Snowman, the gap can only narrow. Debate is raging over who’ll be cast as chain-smoking loose cannon Hole. Cheroot-chomping Danish-American star Viggo Mortenson is an early favourite despite being 53 while Hole is around 40, but whoever lands the role will become an overnight tourism ambassador for Norway, and Oslo will enjoy the influx of Nesbo fans and intrigued travellers that’s sure to follow. There’s no guarantee Scorsese will choose to film there, but if he does he’ll be looking for significant tax concessions because the oldest of the Scandinavian capitals, founded 1,012 years ago, is by no means cheap. 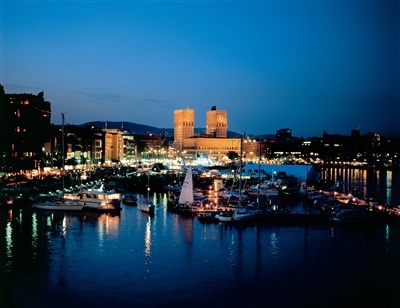 In Bloomsberg Businessweek’s 2011 list of the 30 most expensive cities in the world it came second after Tokyo, and Stavanger, on Norway’s southwest coast, was fourth. A none-too-fancy lunch for one in a restaurant in the touristy parts of Oslo costs around 225 krone/€30, a pint of lager is 70kr/€9.30 and a dozen eggs will set you back 50kr/€6.60. Why a weekend visitor would want to buy a dozen eggs, I don’t know, but they’re included in most cost comparison indexes. Happily, a few days in Oslo needn’t cost the Earth. Away from the pricey waterfront and the main thoroughfare, Karl Johans Gate, there are plenty of good value places to eat and drink where the arrival of the bill won’t bring on a heart attack, and Nesbo fans will be delighted to know Hole’s favourite hangout, Restaurant Schroder (8 Waldemar Thranes Gate), is among them. This neighbourhood establishment that opened in 1925 has seen custom grow with the release of each Nesbo book, but the owners have refused to jump on the Harry Hole bandwagon out of respect for long-time loyal diners, so don’t go in flashing your camera in people’s faces while they tuck into their stekt flesk og duppe (thick slices of fried bacon with sauce, mashed turnip and boiled potatoes). Rather, sit down and order this hugely popular signature dish which accounts for 70 per cent of the meals served there. Behind the building opposite Schroder is the Underwater Pub (4 Dalsbergstien), where Hole sought solace when he mistakenly believed he was no longer welcome in Schroder. Owned by Englishwoman Margaret Herron, the Underwater is a remarkable place. Go early on Tuesday or Thursday evening to nab a table before the crowds arrive and you’ll be treated to a night at the opera, with professional singers performing popular and lesser-known works. I don’t know my arias from my elbow, but I can say that no ‘gig’ has ever left me so enchanted — or so embarrassed. I thought it would be a good idea to record one of the two mezzo sopranos singing so I could play it to the lads when I returned to Dublin, but like most of my good ideas it backfired. If you’re going to record someone singing in a dark bar, don’t confuse the PLAY button with the STOP button when they’ve finished. The first singer sat down, the second stood up, and as she struck a dramatic pose and took a deep breath the audience were treated to a full-volume repeat of her colleague’s voice. I nearly choked on my pizza (you can bring your own food, or place an order at the bar and three local restaurants will deliver to your table), but fortunately everyone saw the funny side. Three minutes’ walk from Schroder and the Underwater Pub is 5 Sofies Gate, where Hole lives. Confusingly, two apartment buildings in the same block share that address, so Nesbo fans who want to photograph the door buzzer with Hole’s name beside it could be disappointed. The 5 Sofies Gate actually in Sofies Gate is the wrong one; the 5 Sofies Gate just around the corner at 5 Dovregata is the one you want. 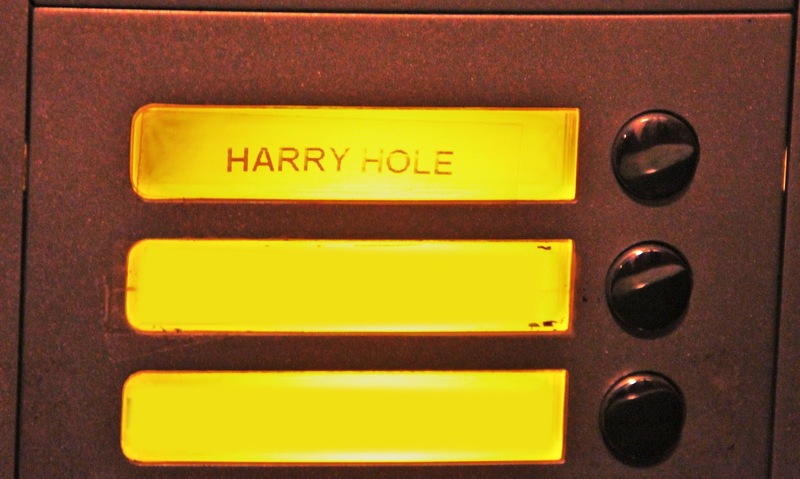 But dare you press the buzzer? I did, expecting either a friendly chat or a tirade for being a nuisance, but there was no answer. I suspect the apartment’s unoccupied, or the resident, who doesn’t mind being pestered, was out. Walk down Sofies Gate and continue along Holbergs Gate and you’ll arrive at the 5-star Radisson Blu Scandinavia Hotel where, from the 21st floor Summit bar, there’s a 180-degree view of the city and Oslo Fjord. 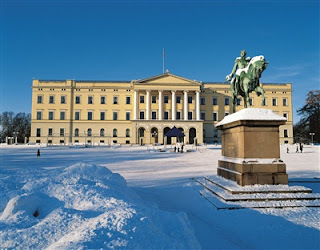 The hotel overlooks the Royal Palace (there are daily guided tours), and both are integral to the plot of The Redbreast in which Hole must find the owner of a rare Marklin sniper rifle that’s been smuggled into Norway. Who has it, and whose head is destined to appear in the crosshairs? The book is populated by a rogues gallery of repulsive characters including old and neo-Nazis, and the two parallel plotlines flit between modern day Oslo and the Eastern Front in 1944 before colliding on May 17 (Norwegian Constitution Day), 2000 in the hotel. In The Redeemer, Christmas shoppers are enjoying a Salvation Army concert in Egertorget Square when a shot rings out and a young officer drops dead, killed by a single bullet to the head fired at point blank range. The killer, a Croatian hitman known as The Little Redeemer, disappears, leaving Hole and his colleagues with no suspect, no murder weapon and no apparent motive. When the assassin learns he’s killed the wrong man he remains in Oslo to finish the job. 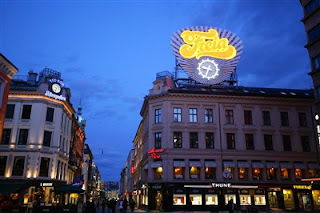 Egertorget, a small plaza on Karl Johans Gate close to the Stortinget parliament building, is unremarkable but for the big neon sign advertising Norway’s best-known chocolate brand, Freia. Immortalised in Roald Dahl’s book Charlie And The Chocolate Factory, it was also famously endorsed by another Roald, explorer Amundsen, who said on his return from the South Pole that Freia had been one of his team’s main sources of nourishment. Visitors to Oslo who have yet to discover Nesbo’s books won’t give Egertorget a second glance, but for fans this is Holey ground. A five-minute walk from Egertorget takes you to Sehesteds Gate (between Kristian IV and Kristian Augusts Gates). Halfway along Sehesteds is another small but altogether more attractive plaza with a circular fountain. Here you’ll find Aschehoug publishing house which first put Harry Hole on the beat and former aspiring professional footballer and economist/stockbroker Nesbo, who’ll be 52 on March 29, on his way to becoming a multi-millionaire best-selling novelist. The author sent the manuscript of his first Hole story, The Bat, under a pseudonym to Aschehoug more in the hope of a polite rejection and constructive criticism than acceptance, but accept it they did. Nesbo delights in telling how, when summoned to Sehesteds Gate to discuss the publication of his book, he was asked why he hadn’t submitted it under his own name. Being at that time a member of well-known rock group Di Derre (Those Guys), he said he didn’t want to be known as a celebrity musician turned author. He needn’t have worried — they’d never heard of him or the band. Established in 1872, Aschehoug has published many of Norway’s best-known writers, foremost among them Henrik Ibsen (1828-1906), who’s buried in Var Frelsers (Our Saviour’s) Cemetery. Try to find his grave, though, and that nearby of artist Edvard Munch (1863-1944) from the maps posted at the entrances and you’ll be searching until Judgement Day. At least then you’ll be able to ask them which holes they’ve just emerged from. I eventually located Ibsen’s tombstone after asking a man out walking his dog. “There it is,” he said, pointing to a black marble obelisk with a golden hammer engraved on the front, just 10 feet from where I was standing, but of Munch there was no sign (I later discovered I’d circled his monument several times, but there was no inscription on the pillar on which his bust sits — his name is on a stone that was covered with eight inches of snow). 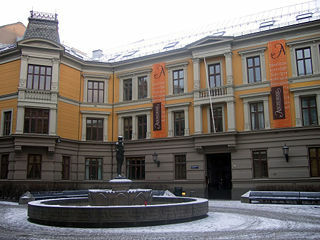 The triangular-shaped cemetery, which opened in 1808 for the interment of victims of famine and a cholera outbreak during the Napoleonic Wars, is bordered by Akersbakken, Akersveien and Ullevalsveien streets, and for Nesbo fans the apartment building at 15 Ullevalsveien is a stop on the Harry Hole tour. Overlooking the cemetery, this is where, in The Devil’s Star, water dripping from a kitchen ceiling (Nesbo adds two more floors to the building) triggers an investigation into the murder of the young woman upstairs — one of the fingers of her left hand has been cut off and a five-pointed red diamond inserted under her eyelid. A few days later, an actress goes missing and her severed finger adorned with a five-pointed red diamond ring arrives in the mail at the Police Department. Then a young secretary, also minus a finger, is found dead in the toilet at work and wearing an earring containing the serial killer’s now trademark star-shaped red diamond. Not on the Harry Hole walking tour, though it can be seen from almost everywhere in Oslo, especially at night when it’s lit up, is the Holmenkollen ski jump (from the city it’s a 20 to 30-minute ride on the westbound metro). 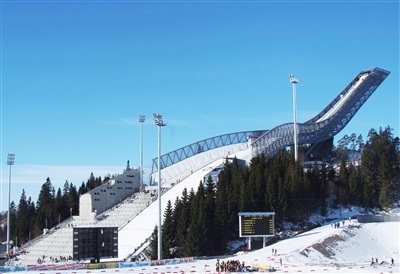 Holmenkollen is the setting for The Snowman’s dramatic showdown when Hole — now minus a couple of fingers himself after a run-in with some white-hot piano wire — is handcuffed to the homicidal maniac he’s been hunting and the pair are dangling from the top of the jump (the old one; it was demolished and rebuilt on the same site) with a killer drop below. Having read Larsson’s three books in quick succession and finding myself hungry for more of the same or similar Scandinavian noir, The Snowman was the first Nesbo book I picked up. In it, Hole is pitted against the cleverest, most cunning, conniving and unbelievably sadistic antagonist he’s ever encountered, the one who comes closest to proving more than a match. I was hooked. You needn’t, however, be a Nesbo fan to enjoy a long weekend in Oslo, nor does following in the footsteps of Harry Hole necessarily mean leaving a tell-tale trail in the snow. 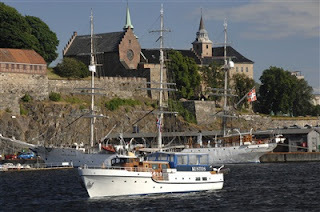 Oslo in summer can be surprisingly warm, with picnics in the parks, leisurely lunches on sun-trap cafe terraces and long days spent on the beaches along the fjord and on its many islands which are served by regular ferries. 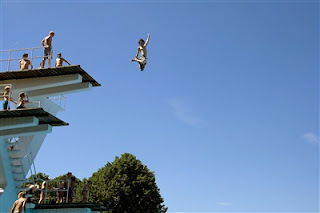 Public swimming pools abound, but it’s the Frognerbadet outdoor complex with its high diving boards, snack bars and wide grassy areas next to Vigeland Sculpture Park that draws the biggest crowds. It’s also the scene of one of several grisly murders in Nesbo’s longest and goriest book, The Leopard, in which he introduces what is probably the most terrifying instrument of death ever invented, though fortunately only on paper. The 80-acre sculpture park, with 212 bronze, cast iron and granite pieces by the prolific Gustav Vigeland (1869-1943) who also designed the Nobel Peace Prize medal, is visited by more than a million people each year and is another picnic hot spot on fine days. But it’s the 1997 bronze sculpture by Wenche Gulbrandsen of a gauntleted right hand with downward-pointing index finger in Christiania Torv (Square) that especially caught my eye. 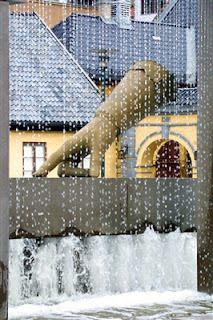 The centrepiece of a fountain, it indicates the spot where, in 1624 following a devastating fire, King Christian IV declared: “Here the new city shall lie.” And indeed, modern Oslo grew from here. Christian, who ruled Denmark-Norway from 1588 until his death in 1648, was not only the big cheese, he was a bighead too, and named the new city after himself. Christiania only reverted to its original and present name in 1925. Not far from Christiania Torv is Oslo’s pride and joy, the late 13th century Akershus Fortress and Castle (including the Norwegian Resistance Museum chronicling five years of occupation during World War Two) which was built on the orders of Viking King Haakon V. Sitting on an elevated promontory at the top of the fjord, it offers great views from the battlements of the city, especially looking west over the marina to the trendy waterside Aker Brygge development with its plush apartments and penthouses, bars, restaurants, galleries, shops and exclusive boutiques (this is where oil-rich Norway’s wealth is very much on show). Look northwest and you’ll see the brown brick City Hall, a big, unlovely lump of a building that could be mistaken for a power station but for the lack of a couple of vapour-spewing giant chimneys sprouting from its twin towers. Step inside, though, through the city-side entrance and the contrast with the drab exterior is startling. The massive lobby’s soaring walls and ceiling are a blaze of colours — I’ve never seen the aftermath of an explosion in a paint factory, but I imagine this comes close. Here you’ll see stylised murals by many Norwegian artists depicting the country’s history, working life and culture. It’s quite a sight, one that wows the dicky-bowed dignitaries who gather in the lobby every December 10 for the conferring of the Nobel Peace Prize. A visit to the nearby Nobel Peace Centre affords the chance to poke your eyes back into their sockets after marvelling at those murals and to learn about the prize, past winners and Norway’s role in international conflict resolution. Being a seafaring nation, Norway’s proud and often marauding maritime history is recalled in three fascinating museums on the Bygdoy Peninsula and, appropriately, you hop aboard the 91 ferry (April to October; at other times take the 30 bus) outside City Hall to get to them. 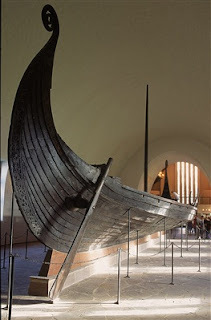 Top draw among this trio of attractions is the custom-built Viking Ship Museum housing the preserved Gokstad, Oseberg and Tune vessels that were excavated from three royal burial mounds along Oslo Fjord at the end of the 19th and start of the 20th centuries. Along with the ships, which date from the ninth century, archaeologists found skeletons, shields, beds, personal items including shoes, combs, cooking utensils and tools and an intricately-carved oak and ash cart designed to be pulled by two horses. What they didn’t find were Viking helmets with horns sticking out of the sides — they’re a myth. The Kon-Tiki Museum celebrates the remarkable high seas adventures of Norwegian explorer Thor Heyerdahl (1914-2002) who, with five companions, crossed the Pacific from Peru to Polynesia in 1947 on a crude balsa wood raft named Kon-Tiki after the Inca sun god. Heyerdahl’s account of the epic voyage, which covered 8,000 kilometres and took 101 days, became a worldwide bestseller following its publication in 1948, and a documentary about the expedition won an Academy Award in 1951. A subsequent Atlantic crossing in 1969 from Morocco to the West Indies on the papyrus reed boat Ra had to be abandoned after 3,000km and 54 days, just 1,000km short of Barbados, when the craft began to fall apart, but a second attempt 10 months later on Ra II succeeded. 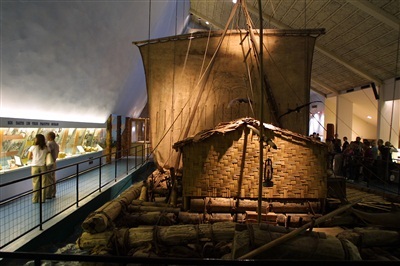 Kon-Tiki and Ra II are the star exhibits in the museum. 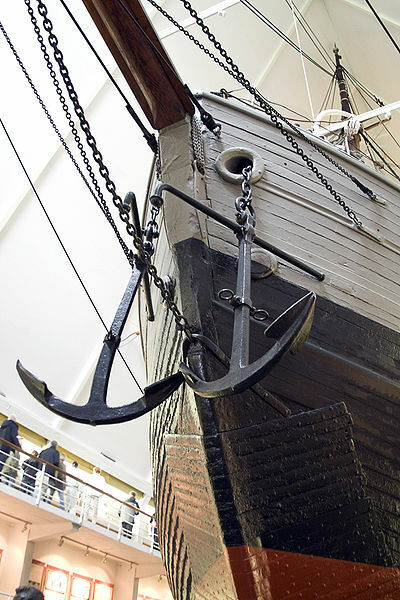 The Fram Museum, which opened in 1936, houses the polar exploration vessel of the same name which is billed as the strongest wooden sailing ship ever built. Launched in 1892, it also holds the distinction of being the wooden ship that has sailed farther north and south than any other on its voyages to the Arctic and Antarctic. Three expeditions have ensured its place in history, all of them led by intrepid Norwegians. From 1893 to 1896, Fridtjof Nansen set out to prove the theory that an ocean current flowed east to west beneath the Arctic icecap; from 1898, Otto Sverdrup and his team of scientists and cartographers spent four years charting the Canadian Arctic islands; and, most famously, explorer Roald Amundsen, the man who beat John Mills (or rather, Britain’s Captain Robert Scott) to the South Pole, made Fram a household name after he raised the Norwegian flag there on December 14, 1911. Back in the present, make a point of visiting the Munch Museum (20 bus and eastbound metro) which displays a vast and regularly-changed collection of the works of expressionist Edvard Munch who painted The Scream, one of the best-known artworks in the world. It and another of his paintings, The Madonna, were stolen from the museum in an armed robbery in 2004 but recovered two years later. 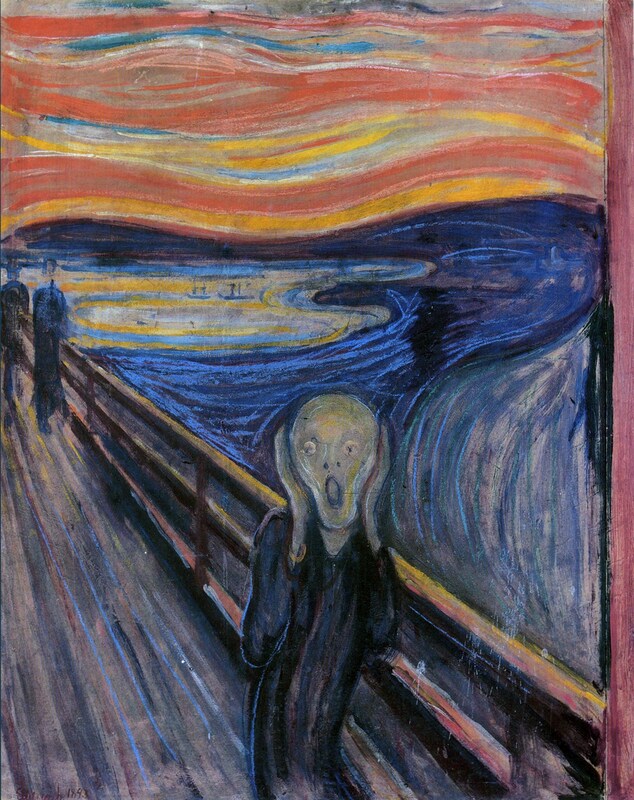 Ten years before, a version of The Scream hanging in Oslo’s National Gallery was stolen, but several months later it too was recovered. If any robber is reading this, bank on walking free the next time you’re up before the judge by first nipping round to Var Frelsers Cemetery where Munch is buried and stealing those bamboozling maps at the entrances — no jury would convict someone who’d done visitors such a huge favour. The UN’s latest quality of life index names Norway as the happiest place to live in the world (Ireland is seventh and the UK 28th), and that probably has a lot to do with the healthy diet and the relaxed, unrushed atmosphere in cafes and restaurants. 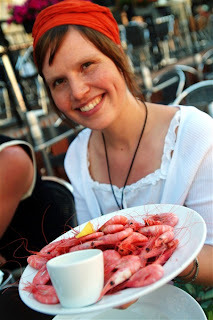 Seasonal dishes include wild game and, in winter, hearty stews and roasts to keep the cold at bay (the Norwegians say there’s no such thing as bad weather, only bad clothing), but it’s the year-round abundance and variety of freshly-caught fish and other seafood for which the country is rightly famed. While you’re picking and peeling your way through a big plate of prawns, Jo Nesbo could be sitting at a nearby table cooking up another batch of the seafood speciality with which he frustrates and infuriates Hole and delights his legions of fans. You won’t find this dish on any Oslo menu, but the main ingredients pack the pages of his books. They’re called red herrings. SAS Scandinavian Airlines (www.flysas.ie) flies daily from Dublin to Oslo Gardermoen International, either directly or via Copenhagen from €75 one way or €149 return (25 per cent discount on child fares). Price includes free online check-in, 23kg baggage allowance and Eurobonus points. AIRPORT TRAINS: Flytoget high-speed trains connect Gardermoen and Oslo S Central Station, with departures every 10 minutes in each direction (Saturday and early morning/late night every 20 minutes). The 47km journey takes 20 minutes and costs 170kr/€22 one way. Tickets bought from the kiosk incur a service fee of 30kr, or 15kr when bought from a machine. AIRPORT BUSES: Flybussen express coaches connect Gardermoen and the central bus terminal, with departures every 20 to 30 minutes in each direction. The journey takes 40 minutes, and tickets cost 150kr/€19.50 to 190kr/€24.75 one way or 250kr/€33 return (child single 80kr/€10.45). The 4-star, 118-room Thon Hotel Oslo Panorama (Radhusgata 7, www.thonhotels.com) is in historical Kvadraturen, one of Oslo’s oldest districts located between Akershus Fortress and Karl Johan’s Gate with buildings dating from the 1600s. Surrounded by museums, trendy boutiques, galleries, bars, cafes and restaurants, it’s a short walk from Central Station, the Royal Palace and the National Theatre and has free wifi throughout. Hot and cold buffet breakfast is included in the price (rooms from 1,125kr/€150 per night). Tasty Thai, 51 Thereses Gate, no alcohol, but great Thai food. Mother India, 63 Pilestredet, brutally hot dishes if you dare. Kafe Onkel Donald, 26 Universitetsgata, near the National Theatre, quality burgers, salads, pastas and rice dishes. Waldemars, 1 Waldemar Thranes Gate, local pub that serves some cheap but tasty meals, good for breakfasts, wraps, pastas and traditional Norwegian dishes. Pizza da Mimmo, 2 Behrens Gate, small, so best to book, but excellent pizzas and nice atmosphere. Jeromes, 33 St. Olav’s Gate, French-inspired cuisine. Trattoria Populare , 2 Trondheimsveien, excellent Italian dishes. Kafe Asylet, 28 Gronland, traditional Norwegian. Cantina Cortina, Folketeateret Passage, seats 20, great Italian. Olympen Mat & Vinhus, 15 Gronlandsleiret, Norwegian and modern, good value for money. Fragrance of the Heart, 2 Fridtjof Nansens Plass, City Hall, and 9 Stortorvet, Glasmagasinet, vegetarian and vegan cafes and coffee houses. Dubliner Folk Pub, 28 Radhusgata, kitchen open daily from 2 to 9pm serving snacks, burgers, salads, sandwiches and a fantastic Irish stew. Live trad sessions on Tuesday and Saturday evenings, live music most nights. *Thanks to Oslo residents Eva Britt Kornfeldt, Marit Utaker, Mari Atlanta Lunde and Robert D.I. Phillips for recommendations. An Oslo Pass will pay for itself if you make the most of it. Available for 24 hours (230kr/€30), 48 hours (340kr/€45) and 72 hours (430kr/€56), it allows free entry to 30 museums and attractions, unlimited travel on public transport including the metro, buses, trams, local trains and ferries to the islands in the inner fjord, parking in municipal car parks, free walking tours, discounts on sightseeing and car hire and special offers in restaurants and shops. Harry Hole walking tours (150kr/€20 per person) are organised on request for groups of 12 and more by Oslo Guidebureau (www.osloguide.no) and start from the lobby of the Radisson Blu Scandinavia Hotel. Book through the Guidebureau website (the tour is free for Oslo Pass holders).